President Donald Trump celebrated the confirmation of Brett Kavanaugh to the Supreme Court at a rally in Kansas on Saturday, condemning Democrats for what he called a "shameless campaign of political and personal destruction" against Kavanaugh. "I stand before you today on the heels of a tremendous victory for our nation," he said to roars. Kavanaugh was sworn in as a justice Saturday evening in Washington after an extraordinarily fraught nomination that sparked angry protests, nail-biting votes and a national reckoning about sexual assault allegations and who should be believed after Kavanaugh was accused of sexual misconduct when he was a high school and college student. He denied the allegations, but nearly all Senate Democrats voted against his confirmation. Trump invited reporters traveling with him to watch the final vote in his private office aboard Air Force One, then delivered a thumbs up from his desk as the confirmation was made official. Trump, throughout the day, insisted Kavanagh would not be tainted by the sexual assault allegations from Christine Blasey Ford and others that nearly tanked his nomination, declaring he was "100 percent" certain his nominee was innocent. "I have no doubt," Trump said, telling reporters that he had chosen Kavanaugh, in part, because "there's nobody with a squeaky-clean past like Brett Kavanaugh because he is an outstanding person and I'm very honored to have chosen him." He said Kavanaugh had withstood a "horrible, horrible attack" that "nobody should have to go through." He said "radical Democrats" have become "an angry, left-wing mob" and "too dangerous and too extreme to govern." And he urged Kansas voters to send Republicans to Congress. "We have a lot of women that are extremely happy — a tremendous number — because they're thinking of their sons, they're thinking of their husbands and their brothers and their uncles and others and women are, I think, extremely happy," he said. 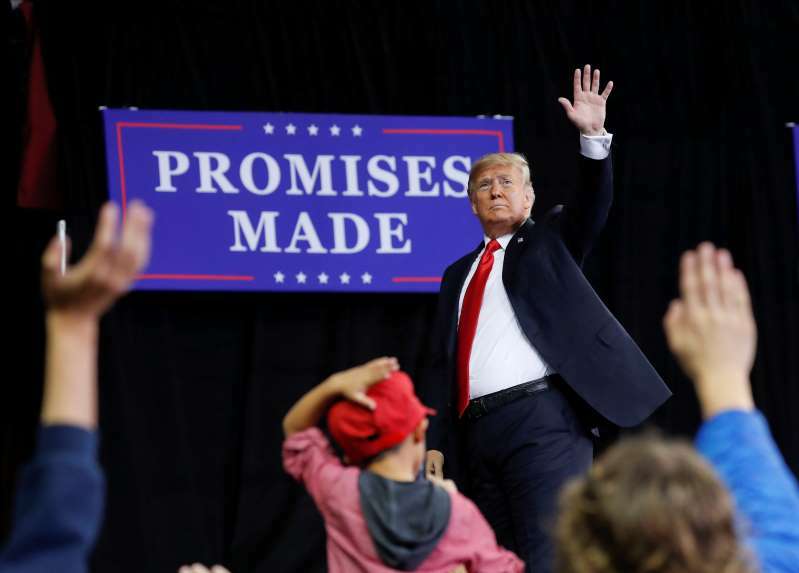 Trump also pointed to television footage of protesters outside the Capitol, and said their numbers paled in comparison to the thousands of supporters awaiting him in Kansas. Of the protesters, he said: "that crowd could fit in the second row." Trump also revealed that he believes a rally speech in which he mocked Christine Blasey Ford's Senate testimony had been a turning point for the nomination. White House officials now say they view the speech as a turning point that changed the momentum as it appeared Kavanaugh's nomination was at risk. He said Saturday he thinks Republicans "are going to do incredibly well" in the midterm elections after Kavanaugh's confirmation.